Leafy Spurge, a relatively long-lived, deep-rooted, herbaceeous species in the spurge (Euphorbiaceae) family is currenlty invading northern and central New Mexico. It primarily invades disturbed and undisturved areas, including pastures, rangeland, abandoned croplands, roadsides, wasteland, woodlands, flood plains, riparian communities, mountain ridges,and prairies. This pest grows in many habitats and soil types from stream banks to rangelands, but appears to thrive in semi-arid areas where competition from other species is low (Lajeunesse et al 1999). Leafy spurge shoots emerge in early spring. Seedlings are a distinct deep red to purple color, and are generally poor competitors, with mortality aroung 80% (Raja et al 1963, Morrow 1979). Once established (within 4 to 8 weeks) seedlings perennialize and begin producing underground lateral roots and stems. Adult leafy spurge plants produce inflorescences from May to July, with a second set of inflorescences formed in the fall. In hot and dry climates similar to New Mexico, leafy spurge can have a dormant period during the summer, with growth resuming in the fall. Leafy spurge is native to Eurasia and has proliferated throughout much of the world and is a major economic the northwestern and north central part of the United States. It was likely introduced to the United States numerous times, as an ornamental species in the 1800�s, and as a contaminant in grains and/or ballast water. 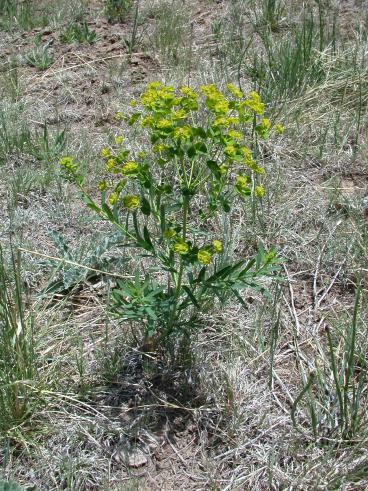 Once established, leafy spurge spreads rapidly, crowding out desirable species and secreting allelopathic chemicals, which prevent the growth and re-establishment of desirable species. Leafy spurge was firsidentified in New Mexico in Colfax County in 1987 and currently found in the northern part of the state. Several smpopulations also exist in Lincoln and Otero counties. Leafy spurge stems are pale blue/green, hairless, erect, woody at the base, and generally 1-3 feet tall. The first leaves are opposite, but become alternate. Leaves are 1 to 4 inches long, sessile, and linear to oblong in shape. When injured, the plants release a milky white sap that irritates the skin and eyes. It has an extensive rhizomatous root system that can reach depths of 30 feet. Roots are brown in color and have numerous pink buds where vegetative growth occurs. Leafy spurge produces showy, yellow/green, heart- or kidney-shaped bracts at the end of the stems that are often mistaken for flowers. Bracts are formed 2-3 weeks prior to flowering, and flowering occurs between May and July. Small, inconspicuous flowers are located within these bracts, and form umbel-like inflorescences consisting of many male flowers surrounding a single female flower. Each female flower produces a three-seeded, lobed capsule. When mature, the capsule explodes dispersing oblong, grey to yellowish-brown seeds up to 15 feet from the parent plant. Leafy spurge spreads through both vegetative and sexual reproduction. Vegetative reproduction occurs from both shoot crowns and root buds, with vegetative reproduction beginning as early as 7 days after seedling emergence. Shoot buds can form almost anywhere along the root system, and have been excavated to depths of 15 feet (Best et al. 1980). This extensive root system allows infestations to thrive even after management. Flowering and seed production generally do not occur in the first year. Seed dispersal on older plants commences in mid-July with plants producing approximately 150 seeds per flowering stem, and patches producing 24 to 3400 pounds of seed per acre (Selleck et al. 1962). Seed germination rates range between 60 and 80 percent with most the seeds germinating within the first 2 years, however, seeds have been estimated to survive in the soil for 5-8 years (Selleck et al. 1962). Initial dispersal occurs when fruit capsules split, in an explosive manner. Seeds can secondarily disperse when ingested or transported on animals, in clothing or shoes/mud, and on vehicles or equipment. Seeds also float, allowing infestations to quickly spreading down waterways or in floodplains (Lym 1994). Preventing infestations and eradicating populations before they become established is extremely important for leafy spurge control. Due to copious seed production and large number of long-lived underground roots, large established populations are impossible to eradicate, and continuous aggressive management measures are needed to keep populations under control. 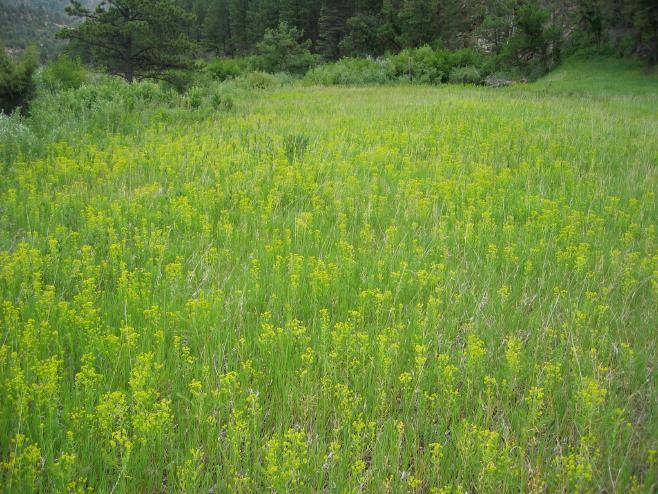 To prevent leafy spurge infestations from occurring, land managers should avoid using machinery, feed, and livestock that may carry seeds or root fragments, and purchase only certified weed-free forage, seed, and gravel. Management of nearby infestations is critical to prevent the spread into new areas. Other than continuous tillage or grazing in an agricultural situation, herbicides alone and in combination with other management strategies are the most effective measures for controlling leafy spurge. Revegetation is an essential part of leafy spurge management to prevent/decrease re-infestation. Planted desirables should include those that actively grow in the spring, summer, and fall to compete with leafy spurge for nutrients and water. �Manska� pubescent wheatgrass (Agropyron intermedium ssp. Barbulatum), �Rebound� smooth brome (Bromus inermis), �Rodan� western wheatgrass (Pascopyrum smithii), and �Arthur� Dahurian wildrye (Elymus dahuricas) have all shown 70-80% control over leafy spurge when planted in treated areas in North Dakota, but have not been tested in New Mexico. Because of its expansive root system, hand removal of leafy spurge is not an effective or recommended management strategy. Repeated mowing or hand cutting can control seed production, but it is ineffective at preventing expansion. Mowing, however, can decrease the competitive ability of desirable competitive grasses and forbs growing with leafy spurge. Tillage can be effective, but only in agronomic settings as it must be used in a timely and intensive manner. Leafy spurge infested areas should be tilled every three weeks throughout the growing season, unless used in combination with herbicide treatment in the fall. If herbicides are applied before cultivation, they should be applied at least one week prior to cultivation, to insure translocation of herbicide into the underground roots and stems. If using machinery to manage leafy spurge, equipment should be cleaned to prevent the movement of seeds or root fragments to uninfested areas. Grazing by goats or sheep in combination with either herbicides or insects can prevent seed production, and decrease the spread of leafy spurge. Grazing should begin in the spring when plants are 2 to 6 inches tall, and continue until the yellow bracts are gone from the field. Stocking rates of 3-6 sheep/acre/month or 1- 2 ewes with lambs/acre/month, or 12 -16 Angora goats/acre/month are appropriate (Lym and Zollinger 1995). If using grazing in combination with a biocontrol agent such as the flea beetle (Aphthona spp. ), graze once in the spring and once in the fall, and leave the summer for the beetles to complete their life cycle on the plant. If using grazing in combination with herbicides, graze plants as above, allow 2 to 6 inches of leafy spurge regrowth before re-grazing then remove grazers in the fall, allow 3 to 4 inches of regrowth, and apply a recommended herbicide. Grazers should be kept in quarantine for 5-6 days after grazing leafy spurge to prevent spread into uninfested areas. Cattle, horses, and native herbivores avoid eating leafy spurge, but will consume it if there is no alternative. This should be avoided as both cattle and horses can become weak and die if they consume large quantities of leafy spurge. Eight beetles, four moths, and five fly species are being tested or have been released on leafy spurge in the United States with varying results. Five flea beetles in the genus Aphthona (A. cyparissiae, A. czwalinae, A. flava, A. lacertosa and A. nigriscutis) have been introduced and established with varying success into New Mexico. Larvae of Aphthona spp. feed on the roots, while adults feed on the leaves, flowers and stems. In New Mexico as in most of the western United States, A. lacertosa and A. nigriscutis have been the most successful. A. lacertosa is generally associated with loamy-clay soils in both wet and dry habitats, and therefore can establish in a wider range of areas compared to other species. A. nigriscutis is generally restricted to drier, sandier sites than A. lacertosa, though both have shown good potential for controlling leafy spurge. Adult beetles are easy to collect with a sweep net and can be redistributed to areas lacking beetles. We recommend collecting beetles in the field in late July to ensure healthy beetle populations. Aphthona beetles have been released on almost every known population of leafy spurge in New Mexico, and if released at rates exceeding 200 beetles per square yard, the insects can reduce leafy spurge biomass by > 95%. Other insects have been introduced and have yet to establish in New Mexico. These include a gall-making fly, Spurgia esula, and several other flea beetles (Aphthona cyparissiae, and A. czwalinae). Apthona. flava has been released multiple times, but only one population has established. Although not yet introduced into New Mexico, the long horned beetle, Oberea erythrocephala, feeds on the stems and roots of leafy spurge. Adults appear in early to mid summer and feed on flowers, leaves, and stems before depositing eggs within leafy spurge stems. Larvae bore their way through the stems to the roots, and feed within the crowns and roots until the following spring, when they pupate in May. The long horned beetle appears to be most successful in leafy spurge populations found along sunny rivers and streams, though its success rate is less consistent than the flea beetles mentioned above. Herbicides are currently the most effective and economical way of managing leafy spurge, but they require annual applications at a minimum for several years to attain adequate control. Tordon (picloram) is the most effective, but because of its environmental restrictions, other herbicides are also used. If two herbicide treatments are used in a season, the first treatment, in late spring/early summer is applied to prevent seed production, and the second treatment in the fall to maximize herbicide into the root system. Prescribed burning in conjunction with herbicide treatment can be effective for controlling leafy spurge when burning is used to remove dead aboveground plant litter, kill seeds, and to produce a more uniform spurge stand for follow-up herbicide treatment (Wolters et al. 1994). For all herbicide applications, it is important to read the herbicide label BEFORE making any application, as different herbicides will have different requirements and restrictions. Tordon †‡ Picloram 1.0-2.0 lb/A (2-4 qt/A) Flowering and in fall if regrowth. Residual herbicide. Selective, higher rate will damage more grass species. Re-treatment for several years may be required. 85-90% control for multiple years. Grazon P + D*‡ Picloram + 2,4D 0.25 lb/A + 1.0 lb/A (2 qt/A) Flowering and in fall if regrowth. Residual herbicide. Selective, will not harm many grass species. 40-60% control yr 1, increasing 10% per year to 90-95% in 5 years with annual applications. Plateau Imazapyr + methylated seed oil 8-12oz/A + 1.5-2pt/acre Late August - September. Residual herbicide. Selective, will not harm many grass species. If cool season grasses are present, do not exceed 8oz herbicide/A. Many products1 *‡ 2,4D 1.5lb/A twice per year OR 3lb/A once per year Flowering and in fall if regrowth. Selective. Not as effective as Tordon, but cheaper and less restrictive. Banvel, Clarity, Vanquish, Veteran * Dicamba 1-4qt/A Flowering and in fall if regrowth. Selective. May have grazing restrictions. 50-80% control the first year. Many products *‡ Glyphosate 1 qt/A In fall when regrowth is visible, but after seed set. Non-selective. 80-90% control the first year, but re-treatment will be needed. Recommended before reseeding desirable grasses. The Nature Conservancy's page on Leafy Spurge, containing photos and a Species Management Summary. 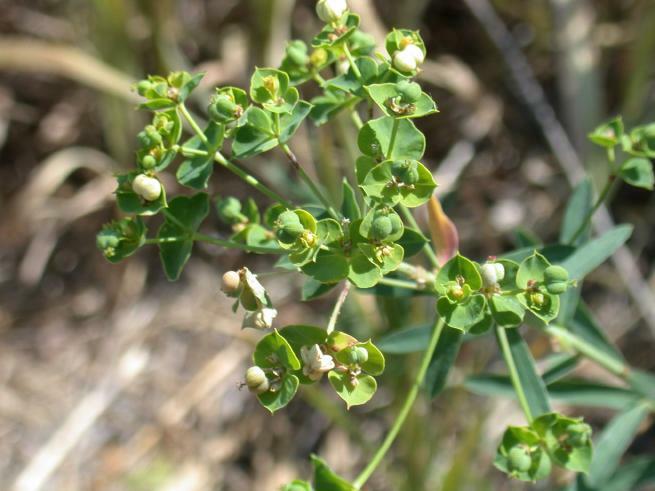 California Department of Food and Agriculture factsheet on multiple spurge weeds. The Plant Conservation Alliance's Alien Plant Working Group's fact sheet on Leafy Spurge. A detailed Montana State University publication on Leafy Spurge. This is the University of Nevada Cooperative Extension fact sheet on managing Leafy Spurge. TEAM Leafy Spurge is a USDA-ARS research and demonstration program focusing on the Little Missouri River and associated watersheds in Wyoming, Montana, North Dakota and South Dakota. Its goal is to research, develop and demonstrate ecologically based integrated pest management strategies that landowners and land managers can use to achieve effective, affordable leafy spurge control. Best, K.F., G.G. Bowes, A.G. Thomas, and M.G. Maw. 1980. The biology of Canadian weeds. 39. Euphorbia escula L. Can. J. Plant Sci. 60: 651-663. Lajeunesse, S., R. Sheley, C. Duncan, and R. Lym. 1999. Leafy Spurge. In: R. L. Sheley, and J. K. Petroff (eds). Biology and Management of Noxious Rangeland Weeds, Oregon State University Press, Corvallis, OR. Lym, R.G. 1994. cology, economic impact, and control of leafy spurge. Proc. Western Section, Amer. Soc. Of Animal Sci. Vol 45. Lym, R.G., and R.K. Zollinger. 1995. Integrated management of leafy spurge. N. Dak. State Univ. Ext. Serv. Pub. W-866. Morrow, L.A. 1979. 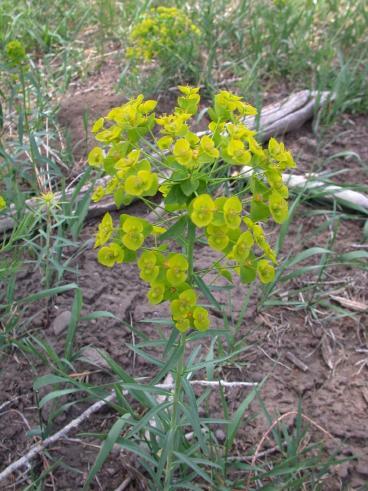 Studies on the reproductive biology of leafy spurge (Euphorbia escula). Weed Sci. 27: 106-109. Raju, M.V.S., T.A. Steeves, and R.T. Coupland. 1963. Developmental studies on Euphorbia escula L. Morphology and Root systems. Can. J. Bot. 41: 579-589. Selleck, G.W., R.T. Coupland, and C. Franklin. 1962. Leafy spurge in Saskatchewan. Ecol Monogr. 32: 1-29. Wolters, G.L., C. Hull Sieg, A.J. Bjugstad, and F.R. Gartner. 1994. Herbicide and fire effects on leafy spurge density and seed germination. Proc. Great Plains Ag. Council 14. Leafy spurge control in the Great Plains. Bozeman, MT, 44.